Located in Johnston County, North Carolina, we are a fourth generation farm. Kornegay Family Farms is operated by Danny Kornegay, his wife Susie; and their two children, Dan and Kim. And if you decide to drop by, don’t be surprised to see one of the five grandsons riding along in a tractor or learning in the fields! 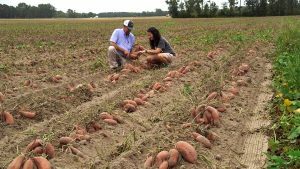 Kornegay Family Produce is the fresh vegetable subsidiary of Kornegay Family Farms – with a focus on delicious and nutritious sweet potatoes. Our Johnston County, North Carolina farmland has the nutrient rich and sandy soil that is ideal for growing sweet potatoes. 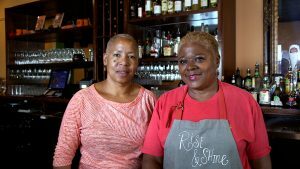 Owners, chef and hostess welcome you to the award winning Sweet Potatoes Restaurant in the Downtown Arts District of Winston Salem, where they serve unique, southern inspired uptown, down – home cooking. Recipes courtesy of Chef Stephanie Tyson.